While it’s generally a good idea to consult an experienced workers’ compensation attorney following a work-related injury, there are certain instances in which it becomes positively essential to securing a favorable outcome. If you or someone you love has recently suffered a work-related injury, you’ll need to ask yourself a few questions. For starters, were your injuries severe enough to warrant hospitalization and/or surgery? 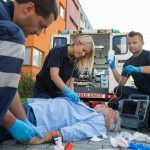 Will you be able to perform your job duties to the extent you could before suffering your injury? Will you, for that matter, be able to maintain gainful employment in the future, regardless of where you work? You will also need to consider whether or not you believe your employer has acted in good faith. For example, if your employer disputed a decision issued by Pennsylvania’s workers’ compensation division, your best bet for receiving financial assistance will be to contact a workers’ compensation attorney immediately. This is especially critical if your medical benefits have been denied. Workers’ compensation attorney Michael L. Studd offers open communication, unfettered access and personalized legal representation to clients throughout the Pittsburgh. In applying his more than 10 years’ experience with workers’ compensation suits, Michael provides the kind of focused legal counsel often associated with larger firms, but with the attentive service akin to a boutique firm. Call (412) 400-6157 now to schedule your free consultation.